Joan Colby is the author of seven published books including The Lonely Hearts Killers, The Atrocity Book, etc. 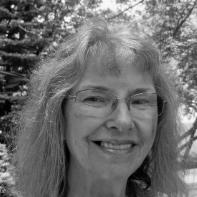 She has published poems in many journals including Poetry, Atlanta Review, Spoon River Poetry Review, The New York Quarterly, South Dakota Review, Epoch, etc. She is the recipient of two Illinois Arts Council Literary Awards (one in 2008) and an IAC Literary Fellowship. She received honorable mention in the 2008 James Hearst Poetry Contest—North American Review and the 2009 Editor's Choice Contest—Margie, and was a finalist in the 2007 GSU (now New South) Poetry Contest, 2009 Nimrod International Pablo Neruda Prize, 2010 James Hearst Poetry Contest and Ernest J. Poetry Prize. With promise of loss, loss. Of the world to the sky. Time to die. Time to die. rom the burning pit by the creekbed. Scour bleached skies to indifference.